For the folks at DC Comics this must be a truly festive season. For the third month in a row, their sales have been good for goodness sake, taking out the top spot once again, as Marvel closes the unit share gap to an unbelievable 1.82%. In November 2011, Image Comics grabbed the mantle of 'Publisher #3', with 4.6% unit share. MY THOUGHTS: God Jim Lee knows how to draw a great cover. I'm guessing Henny Pennies out there waiting to exclaim 'The sky is falling!' over the DC 52 saw this month's leap by the 'House of Ideas' as just that moment. 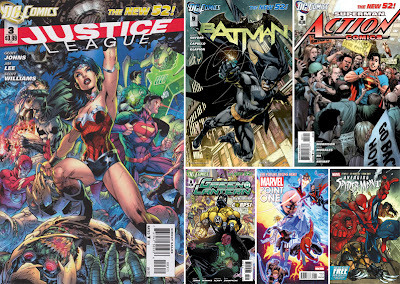 However, the third issues of the top four DC titles held onto the top spots, despite Marvel's monthly offerings containing a #1 issue from both their top franchises. That's right - Green Lantern #3 bet both Avenging Spider-Man #1 and Uncanny X-Men #1 (book #7), which has to show the steam the 52 is still cooking with. With comic sales up on last year, a battle between the big two unlike any comics has seen before, has finally got the industry back on the right track. Heading up.